A recent article notes that sleep deprivation can cost “over $100 billion in lost productivity, medical expenses, sick leave, and property damage.” The article suggests that about 40% of Americans gets less than 7 hours of sleep. The American Sleep Association (ASA) points out that sleep deprivation, which is essentially not getting enough sleep, leads to serious health issues: diabetes, harm to the brain, deficits in memory and attention, weight gain and depression. ASA also notes that although side effects of sleep deprivation include excessive sleepiness during the day, moodiness, and hunger, some studies show that sleep deprivation enhances mood, and increases alertness and energy. In my experience, my bouts with sleep deprivation make me quite productive. My first encounter with sleep deprivation took place as I danced my feet away during a college dance marathon to raise money for cancer research. I danced about 40 hours with short napping breaks and one shower. I was a college sophomore. Great school spirit and great exercise! After the dance marathon was over Sunday afternoon, I was wide-awake. I wrote a paper for a philosophy class due the next day. My second encounter with sleep deprivation also took place in college but not because I was up days cramming for exams. During this time I went to classes, had lunch and dinner, and spent many hours in the yearbook office. I was the editor-in-chief. After 36 hours without sleep, I met an important deadline. I felt happily accomplished. I have run many half-marathons and marathons. These runs are free of sleep deprivation. Presently, I’m training for my 20th ultramarathon — my 6th 24 hour endurance run. My third encounter with sleep deprivation occurred when I ran my first 100-mile ultra in 2011. At about mile 94, sleep deprived, mentally and physically beaten, and feeling overwhelmed, I began to cry. I slurred my speech. With blisters, body chafing, and diminished cognitive functioning, I walked the last four miles with my patient pacer — my husband. With less than a quarter mile to the finish, I was re-energized. I danced my way to the finish as Public Enemy’s Fight the Power blasted from my iPod into my ear buds. Exhaustion and sleep deprivation vanished. I made it to the finish line in 28 hours, 33 minutes, and 2 seconds. From the time I got up at 4 am to get to the Saturday 6:30 am start to the time I went to bed at 10 pm Sunday night, I had been awake 42 hours. Other than swollen feet, right knee pain, and a couple of blisters, I was perfectly fine. Plus, I was the second female runner to reach the finish line. On Monday morning, I went to work as usual. I was high on cloud nine for about two weeks. The side effect of my sleep deprivation — sheer joy! A more severe and unjoyful encounter with sleep deprivation occurred last year. On one occasion, I went 42 hours without sleep. Soon thereafter, I went 38 hours without sleep. Unlike my encounters with self-imposed sleep deprivation (dance marathon, yearbook deadline, and ultrarunning), both of these unhealthy sleep deprivation episodes were provoked, not by the my inability to write but, by a dissatisfied dissertation advisor. My dissertation experience was an ultramarathon of a different kind and much more painful than the sleep deprivation and the physical beating my ultrarunning body and mind endure. I did not have the support that I enjoy during ultras. But while these episodes of sleep deprivation put my mental and physical health at risk, they came with a silver lining. Had I not experienced these hours of sleep deprivation, I am sure I would have never become a Huffington Post contributor and a Thrive Global contributor. As my journal indicates, on April 11, 2016 I could not sleep. Sleep deprived, I got up at 4:30 am and journaled. I turned on the bedroom TV to one of my favorite cable channels — C-Span2 Book TV. Lo and behold, there was Arianna Huffington talking about the importance of sleep and her book The Sleep Revolution. Toward the end of the interview she shared her email address. I immediately emailed her. I shared I was suffering from sleep deprivation and why. Two days later, I received an email from her inviting me to write for Huffington Post. I experienced a happy awakening and a new purpose. Sleep deprivation works best when it’s self-imposed, purposeful, and short-term. 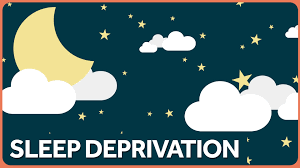 However, when sleep deprivation is the result of unwelcome stressors at the hands of others, loss of sleep and sleep deprivation will eventually result in lost productivity, medical expenses, and the cost of sick leave. This kind of sleep deprivation is never good. Unhealthy sleep deprivation will end and sleep hours will increase when stressors cease. I started to sleep better once my dissertation nightmare came to an end. The university closed the program closed just as I got a new advisor and paid the semester’s tuition. I successfully won my tuition appeal. I sleep about 5 to 7 hours every night. That’s good enough for me. But I continue to experience sleep deprivation during ultras. I embrace the short term discomfort that comes with the rewarding sleep deprivation that is par for the course in ultrarunning. This kind of sleep deprivation takes me to the finish and keeps me healthy. The last time I slept more than 7 hours I was a college freshman. I went home for Thanksgiving break. I went to bed and woke up 19 hours later. I had mono. I missed Thanksgiving turkey. So much for sleep. In my experience, sleep deprivation has resulted in accomplishment and productive awakenings. Benjamin Franklin wrote, “Early to bed and early to rise makes a man healthy, wealthy, and wise.” Homer wrote,”Even where sleep is concerned, too much is a bad thing.” As for me, I find that sleep deprivation has its rewards. Welcome to my Thrive Global author page.To read more of my published works, and about my ultrarunning and writing life, visit my website www.miriamdiazgilbert.com and my FB page https://www.facebook.com/ultramiriam/ I share my ultrarunning adventures, and the running and ultrarunning experiences and writings of others. You can read my interviews with elite and ordinary ultrarunners. I also write about spirituality, gardening, my medical nightmare, living and staying active with chronic illness, and much more.